It is a fact, air travel produces pollution. 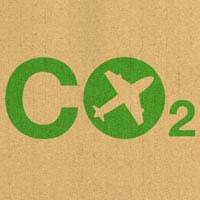 2% of all man-made carbon dioxide emission is caused by aircraft, and that figure is expected to grow to around 3% by the middle of the 21st century. But there is good news to all of these gloomy figures. The International Air Transport Association (IATA) set a ten-year goal in 2000, for airlines to achieve a 10% improvement in fuel efficiency. Not only did the majority of IATA members achieve this target, they actually reached it three years early. New targets have been set for airlines to achieve a further 25% improvement by the year 2020. Modern aircraft are 20% more fuel efficient than they were ten years ago, and a staggering 70% better than 40 years ago. The new double-decker plane, the Airbus A380, aims to burn no more than 3 litres of fuel for every 100 passengers per km travelled – that equates to less fuel burned by the average family car! Although fuel efficiency is a priority for airlines, other factors play a big part in air pollution. For example, poor route planning, air control delays and maintenance problems all result in aircraft being in the sky for longer than is absolutely necessary. This is why the ‘Save a Minute’ campaign has been launched. The idea is simple. If each flight could be reduced by one minute, an overall saving in fuel would result. It might seem a small amount of time to save, but estimates suggest that, by achieving the one-minute saving for every flight in the world, a combined reduction of almost one billion dollars could be achieved. Each flight costs approximately 100 dollars per minute in operating costs, so it is easy to see why such large savings can result. Noise pollution is also a factor. Airports around the world are noisy places, with many residents exposed to irritation during take-off and landings. However, aircraft noise has reduced significantly. Modern planes are 50% less noisy than they were ten years ago, and recently launched targets have been imposed on airlines to reduce this figure by another 50% by 2020. It has been estimated by IATA that the number of people exposed to noise from aircraft (residents living close to airfields) has reduced by about 35% since 1998. Again, technology has played a major part here. Engine designers have made huge improvements in the high-level noise that is emitted from an engine during the take off run. European legislation, which has been adopted by most airlines around the world, requires much greater noise abatement strategies than ever before. Passenger efficiency is also important. Similar to car journeys, it is environmentally much less efficient to travel with a single person in a car than it is to fill the car with three passengers. In 2001, a survey indicated that 70% of seats on UK scheduled flights were filled, compared to only 38% occupancy in cars travelling on major roads in the UK and 33% on trains. Since then, occupancy has been a concern for most airlines. They are actively encouraging booking agents to fill aircraft by reducing prices or by offering discounts for certain journeys. The good news is that charter flights regularly have a massive 89% occupancy. Aviation is at the heart of a positive and sustainable economy. However, that’s no excuse to pollute the sky that we travel through. Much damage has probably been caused by the aviation industry over the last 50 years, but now, with various targets, goals and objectives, air regulators and airlines are taking a responsible attitude towards reducing emissions, lowering noise and improving fuel efficiency.